By stripping the Federal Reserve of power over bank capital plans, the incoming Trump administration could ignite a rapid dividend increase at Bank of America. The more I dig into the impact of the presidential election on banks, the more it seems like Bank of America (NYSE:BAC) will benefit tremendously under a Donald Trump presidency. One of the biggest ways the North Carolina-based bank could gain is from a loosening of regulations around capital distributions -- dividends and share buybacks. Current regulations give the Federal Reserve the authority to veto a bank's decision to increase its dividend or buy back stock. The Fed hasn't been shy about using this power either. In 2011, it denied Bank of America's request to boost its dividend for the first time since the financial crisis. The following year, Bank of America didn't even ask to do so. 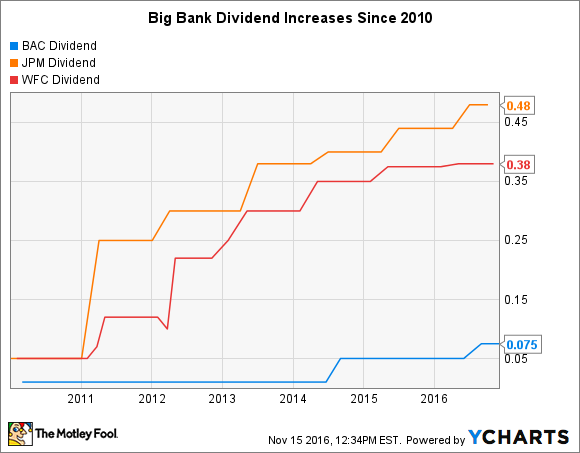 The net result is that Bank of America has only increased its dividend twice over the past eight years. It boosted its then nominal $0.01 per-share payout in 2014 to $0.05 per share. And it did so again this year, raising its quarterly distribution by an additional 50%, to $0.075 per share. BAC Dividend data by YCharts. This stands in stark contrast to many of Bank of America's closest competitors, banks like JPMorgan Chase (NYSE:JPM) and Wells Fargo (NYSE:WFC). JPMorgan Chase has raised its dividend every year since 2011. The nation's largest bank by assets now pays out more per share than it did before the financial crisis. JPMorgan Chase's current dividend is $0.48 per share. And the story is the same for Wells Fargo. Just like JPMorgan Chase, Wells Fargo has boosted its quarterly payout in each of the past six years. Wells Fargo now distributes $0.38 per share each quarter. The net result is that, from the perspective of income investors, Bank of America has been left in the dust by Wells Fargo and JPMorgan Chase. Under a Trump administration, the playing field could soon be leveled for Bank of America. One of Trump's signature policy proposals is to roll back significant portions of the Dodd-Frank Act, which was passed in the wake of the financial crisis and vests the authority to stress test banks in the Federal Reserve. And while it's too early to know exactly what these changes will entail, there's reason to believe that they'll eliminate the Fed's authority to deny bank capital plans. You can get a sense for this by looking at the so-called Financial CHOICE Act, proposed by Republican Representative Jeb Hensarling, who's purportedly being considered by Trump for Treasury Secretary. Among other things, the CHOICE Act would no longer allow the Fed to deny a bank's capital plans if it maintains a leverage ratio of at least 10% -- meaning that its assets are no more than 10 times its tangible equity. It's no exaggeration to think that this could translate into a dramatically higher dividend for Bank of America's shareholders. This follows from the fact that Bank of America distributes half as much of its earnings each year when compared to JPMorgan Chase and Wells Fargo. Bank of America's payout ratio is currently 16%, while JPMorgan Chase and Wells Fargo's are each above 30%. It remains to be seen what path Trump's administration will take when it comes to financial reform. However, if there's any truth to the rumors that the incoming president could use Hensarling's approach as a guidepost, then Bank of America's shareholders may soon be on the receiving end of a much bigger quarterly dividend.